SCH have introduced the PSP sprayer to our range of sprayers to give the customer a low cost, accurate, versatile and simple to use machine. 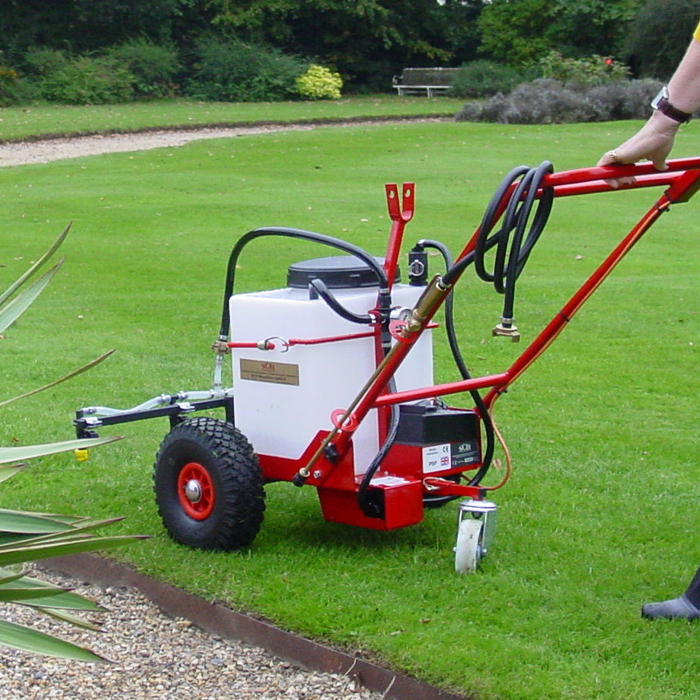 The sprayer has a 30 litre capacity, is mounted on a triangle chassis, two wide profile pneumatic wheels and a rear caster which also acts as a line marker. The pump is a 12 volt diaphragm pump powered from it's own integral battery (a charger is supplied with each machine) a pressure gauge and a by-pass adjuster are fitted for when using hand lance. The pump is ran on a pressure system which means when the spray is 'shut off' the pump 'shuts down'; open and the pump restarts. The low to ground 4 nozzle boom, minimises drift and therefore 'close to edge' work can be carried out. A brass trigger lance is supplied for spot spraying etc. the handle are adjustable to suit the operator. A tow bar is supplied with each machine.